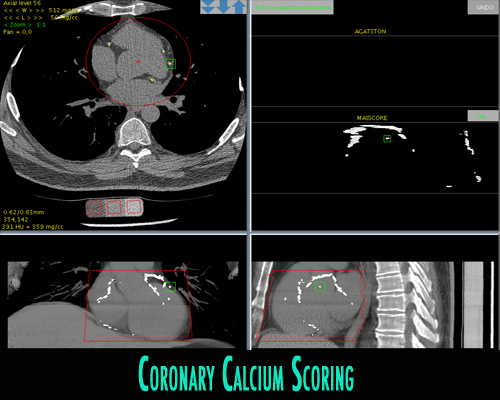 The N-VivoTM Coronary Calcium Scoring Application is the most precise on the market. Our patented software is capable of finding smaller plaques than any other detection method. Our icon-based system makes measuring and reading results easier than ever before. - Scores are CT scanner and scan technique dependent. Fixed and arbitrary plaque HU thresholds and multipliers are not calibrated nor are the voxel densities of the plaque. - The Agatston Score, although valuable in developing coronary artery calcium scoring, has repeatly been shown to produce variable results with precisions too high for optimum therapy monitoring. - Current manual scoring methods are subjective and operator dependent. Manual scoring is time consuming and tedious, especially so if smaller voxel images are used. - Scores vary over time from scanner drift, X-ray tube replacements and changes in scan parameters. In addition, although not yet well recognized, the results vary dependent on the patient's physical composition including size, and bone/ muscle/ fat composition. The methodology of current scoring techniques is too subjective. As a result, scoring algorithms, population reference data, plaque thresholds, and the resulting patient scores vary among different CT manufacturers, over time and between different institutions. Published results report 15% to 40% short-term precision and gross differences in scores between some manufacturers! The N-VivoTM Application offers solutions for all of these limitations. Current calcium scoring products provide a fixed plaque threshold based on uncalibrated HU values, typically 85 or 130 HU. The Agatston score is defined as 2 adjacent voxels above this threshold and was defined from 3 mm slice thicknesses. Small plaques are frequently observed in patient images which fail to satisfy this fixed threshold criteria. In noisy images, it is also clear that false plaques are more likely and are patient and scanner dependent. Although phantom calibration greatly improves on these problems, the variable noise level of images makes plaque identification and quantification in part a statistical challenge. This represents a classical signal-to-noise ratio problem. Our N-VivoTM Calcium Scoring Application provides plaque thresholds, which are patient, scanner, and technique dependent i.e., the voxel mass calculations and plaque thresholds are calibrated and specific for each patient scan and CT scanner. 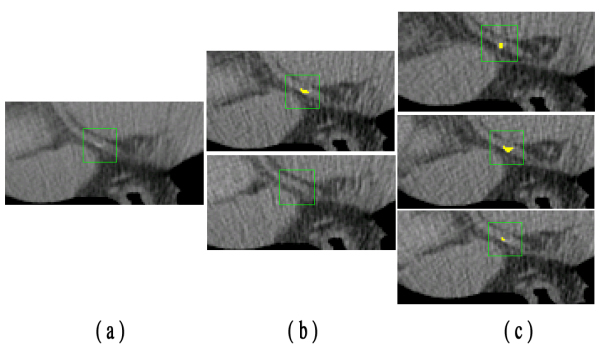 After hybrid calibration of image voxels, plaques are identified and quantified based on the calibrated attenuation of the regions of the heart of the particular patient. Voxels, which may be included in the calculation of plaque mass, are therefore not only calibrated but are included in the final calcium score only after making statistical computations from the specific patient's images. (The uncalibrated Agatston and Volume scores, also provided by our software does not use these advanced techniques but are provided for backwards continuity and reference to other methods). The Mass Score is a new calcium score, which provides a true measurement output of a known physical quantity, mass. Mass Score is computed from phantom calibrated voxels, which differ from the HU threshold values of current scoring software. 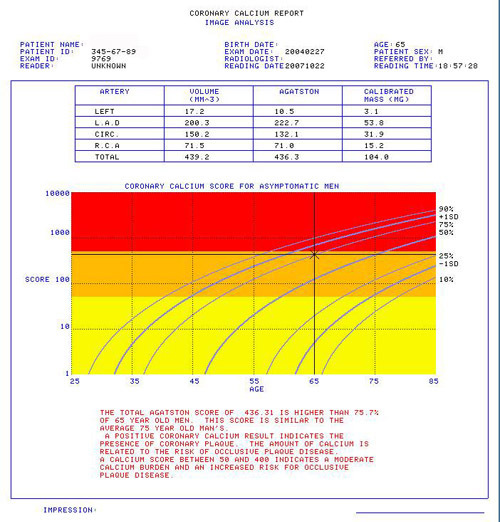 Our software provides the first commercially available automated and simultaneously calibrated mass scores. Calculated pseudo-mass scores, or those corrected with non-simultaneously scanned reference phantoms, may produce qualitatively similar scores, but should not be expected to provide equivalent mass results to simultaneous calibration. Unique to the N-VivoTM Calcium Scoring Application are patented techniques used to automatically score calcium in the heart without operator identification of plaques. From within the automatically placed volumetric Search ROI, the software automatically identifies and quantifies calcified plaques rapidly and displays them in a plaque map. Simultaneously, the plaques are highlighted in the axial images and on the sagittal and coronal reformatted images. The operator can identify and locate to any plaque for review or erase instantaneously. The operator identifies the Left Main and bifurcation and the software identifies the plaques to each of the 4 coronary arteries. Plaque definitions are stored in look-up tables for each calcium score. For example, separate tables are available for the standard Agatston score and our new Mass Score. The software executes the algorithm by automatically identifying plaques that satisfy the specific plaque definition criteria. The scores for each plaque are stored in files identified to the specific coronary artery including each plaque 3-D location. The results provide a Plaque Map with each plaque referenced to a 3-D coordinate system and identified on each of the 4 screen windows. A mouse click quickly locates a plaque to its 3-D location in the volumetric image set. The operator is given the opportunity to modify and position the Search ROI and to erase plaques. The Agatston score in score units, volume score in mm3 and Mass Score in mg of calcium hydroxyapatite equivalence are calculated and reported. The operator need not view each image or make subjective judgments on what is a plaque. The precision of the technique is therefore improved as reader variability is largely eliminated. The scoring process is much faster, allowing automated scoring of small voxel images. A 160 slice scan can be scored in just seconds! Typical scoring methods may fail to show the presence of small calcifications as in (a) and (b) above. Calcium score results are presented in a Clinical Report that includes a table of the specific scores for each coronary artery including the Mass Score, Volume and Agatston scores for each artery and totals. Reference population data for uncalibrated Agatston scores from published studies are provided for risk probability estimations. The distribution of plaque sizes by plaque mass is displayed in a histogram for future research. The reports may be printed or electronically transmitted as DICOM formatted images or made available on a web browser.